phpBB is php/MySQL driven platform and as such it requires a backups for the database to be performed on regular base. 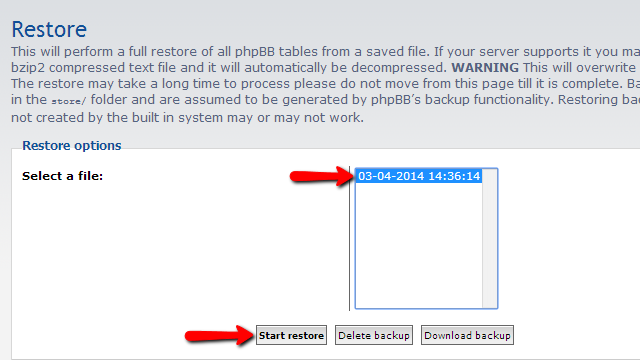 Assuming that you have already generated a backup for the database, in this tutorial we will show you how to restore it using the restoration feature included in the Administration Control Panel of the platform. If you are wondering how to generate a backup for the database you should check our other tutorial on that matter. In order to access the restoration feature you will need to login into the Administration Control panel of the platform and then navigate to Maintenance>Database>Restore. 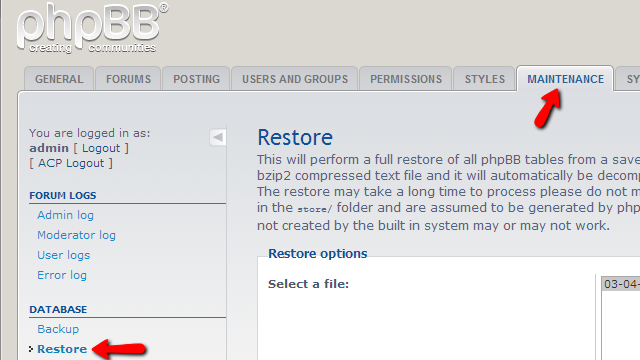 Once there you will be able to notice a detailed description of the feature right below the name of the feature – “Restore”. In order for the restoration process to begin you will need to simply select the backup you would like to restore and then to click on the Start Restore button. Next you will be asked for a confirmation if the database should be restored and once you confirm the restoration it will begin. The restoration process might take a while if the database of your Board is too large and you should allow some time for the process to be finished. The restored database will take the place of your currently used database. This mean that all records added to the database (such as posts, topics, forums, new users, user settings etc.) after the generation of the backup you are restoring will be LOST! At the end you will be presented with message indicating that the database has been restored successfully. Congratulations! You now know how to restore the database of your board from previously generated backup for the same!